If a user doesn't use a security code for their iOS device, then this is the screen graphic that they'll be greeted with. The user simply slides the arrow to the extreme right side to unlock the screen and be presented with their home screen. 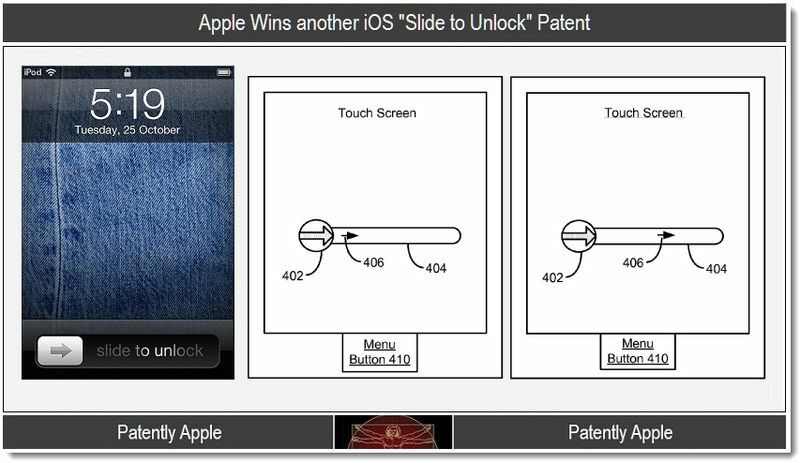 Those choosing to lock their screen with a security code will be greeted with an alternative screen graphic that displays a numeric pad to enter a security password, which isn't covered in this patent. 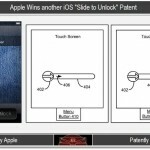 This patent follows an earlier claim whereas Apple explained a method comprising of, “detecting a contact with the touch-sensitive display at a first predefined location corresponding to an unlock image; continuously moving the unlock image on the touch-sensitive display in accordance with movement of the contact while continuous contact with the touch screen is maintained, wherein the unlock image is a graphical, interactive user-interface object with which a user interacts in order to unlock the device; and unlocking the hand-held electronic device if the moving the unlock image on the touch-sensitive display results in movement of the unlock image from the first predefined location to a predefined unlock region on the touch-sensitive display.” Apple credits Senior VP of iPhone Software Scott Forstall along with team members Imran Chaudhri, Bas Ording, Freddy Anzures, Marcel Van Os, Stephan Lemay and Greg Christie as the inventors of this patent, which was originally filed in Q2 2009, according to the report.